Two Manchester University faculty members have been selected as 2014 Education Award winners by Greater Fort Wayne Business Weekly. Susan J. Klein, Ph.D., professor of chemistry, has won the top honor for Science in Higher Education. 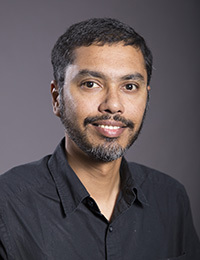 Sreenath Majumder, Ph.D., assistant professor of economics, has been chosen for the Innovation in Teaching Higher Education Award. The awards recognize outstanding teachers who engage and inspire their students, encouraging lifelong learning. Twenty-five educators representing K-12 schools and colleges and universities throughout northeast Indiana will be honored at a reception Oct. 22 in Fort Wayne. Klein, chair of the Chemistry Department, has taught at Manchester since 1998. The North Manchester resident is a graduate of Franklin & Marshall College and earned her Ph.D. at the University of Wisconsin. Her primary responsibility at Manchester is teaching organic chemistry. She also is faculty advisor for the MU chapter of the American Chemical Society. 2010 MU graduate Kyle Watson said Klein inspired him to pursue his Ph.D. in organic chemistry at the University of Notre Dame, where he is on track to graduate this year. “Dr. Klein inspired many students, including myself, to push ourselves and strive to learn and understand chemistry as opposed to just memorize facts,” wrote Watson in his nomination. Majumder, who grew up in Calcutta, India, earned bachelor’s and master’s degrees from the University of Calcutta and his Ph.D. from the University of Houston in Texas. The Fort Wayne resident joined MU’s faculty in 2009 and teaches microeconomics, macroeconomics, econometrics, and money and banking. He says that the study of economics is not simply juggling facts, figures and theories, but learning to comprehend the world around us. Majumder engages students by creating a fun learning atmosphere, wrote Kasey Reneau, a junior from Hagerstown, Ind., in her nomination. “He takes time to learn every student by name so they feel comfortable in class” and that encourages them to learn and ask questions, said Reneau. Majumder also dedicates much of his time to meeting individually with struggling students, Reneau added. Majumder shares the Innovation award with Rachel Rayburn of Indiana University Purdue University Fort Wayne (IPFW). Sponsors of the annual awards are Indiana Wesleyan University, the Questa Education Foundation, Big Goal Collaborative and Keyflow Creative. The reception begins at 6 p.m. at the Holiday Inn near IPFW, 4111 Paul Shaffer Drive. Tickets can be purchased online at fwbusiness.com under “events” or by calling 260-426-2640.